I was recently offered the opportunity to review Yoplait Fiber One’s new Blueberry yogurt—and it could not have come at a better time. With the start of the New Year, Mama’s World is embarking on some challenges to create a healthier, happier, more efficient family—and we are actively exploring products and techniques to help us achieve our goals. Losing weight and adopting healthy eating habits top many New Year’s Resolution lists each year—and Mama’s Corner of the World is no exception! Hectic schedules, busy work and family commitments sometimes make it difficult to choose and offer healthy meals and snacks that are appealing to the entire family. In fact, a recent survey by Yoplait Fiber One found that many Americans felt that flavorless, boring snack options were a key culprit to diet failure. When Mama’s Corner of the World reviews a product, we consider three important factors: (1) Convenience—my world gets rushed and snacks need to be quick and easy to prepare and enjoy (2) Healthy, safe and tasty. If the kids won’t eat it—it doesn’t really matter how nutritious it is, does it? and (3) Value. Obviously, a new product must be worth the price to a budget conscious family. How did Yoplait Fiber One Blueberry yogurt stand up to my mom review? Is Yoplait Fiber One Blueberry yogurt convenient and easy to serve? As with most other yogurt brands, it comes in single serve cups making it portable and quick and easy to serve and eat. 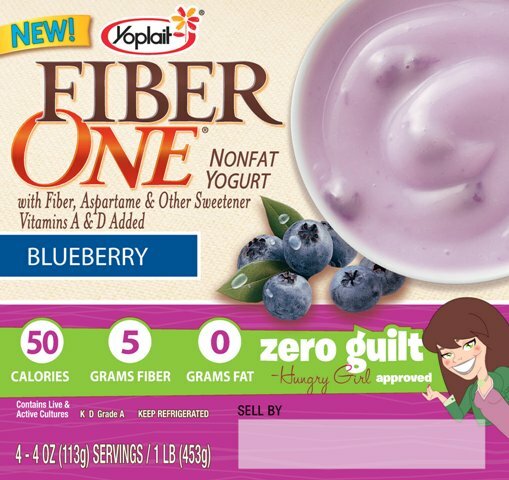 How does Yoplait Fiber One Blueberry yogurt rate on the health and taste checks? Each single serve pack contains 50 calories, 5 grams of fiber, 0 grams of fat, and contains Vitamins A and D—and offers a good source of calcium to the busy girls and their busier mom. The kids liked the new blueberry flavor and the size was just right for snacking. There is also a variety of other flavors available as well to suit different tastes. Does Yoplait Fiber One Blueberry yogurt fit a tight budget? The suggested retail price of a 4-pack of Yoplait Fiber One is $2.79—or approximately $0.70 per serving. Coupons are often available online or through various coupon packs and clubs as well. The price seems reasonable for a healthier snack alternative. Final mom thoughts about Yoplait Fiber One Blueberry yogurt. The product that I sampled offered me the snacking convenience, taste, quality and health benefits at a price that my budget could handle. And now—a giveaway opportunity for our readers! Yoplait and MyBlogSpark have offered up a cool Yoplait Fiber One gift pack for you. One lucky winner will receive a *VIP Coupon for a free sample of Yoplait Fiber One yogurt, as well as a food diary/fitness journal and pen, a sport towel, a water bottle and a blueberry stress ball--just in time for a healthy start to the New Year! As many of you know, I am currently participating in the Yoplait Light Two Week Tune Up—and I would love to hear about your own healthy resolutions for 2011. To be eligible to win the prize pack shown above, simply leave us a comment on this post (with your email address so that you can be notified if you win!) letting us know about your own New Year’s health and fitness resolutions! Contest ends January 12, 2011 at 11:59pm EST! While, it’s not mandatory for this contest, following us via Google Friends Connect (over on the right sidebar) and on Twitter always makes us happy—and it’ll give you one extra entry for each of those "follows" if you let us know in the comments below (again--don't forget to include your email so that we can notify you if you win!) Plus, following us will keep you up to date on all of our upcoming posts, prize pack offerings and giveaways! *The coupon offer for Yoplait Fiber One Blueberry yogurt is not valid in some states, including California, Idaho, Louisiana, Minnesota, New Jersey, Nevada, North Dakota and Tennessee. Contest winner will be required to provide mailing address within 48 hours of notification of win in order to receive gift pack. Failing to respond to prize notification or failing to provide required information within 48 hours will forfeit prize and another winner will be randomly selected. Disclosure: I was provided a free sample of the product reviewed here, as well as a prize pack identical to the one shown, and the second prize pack for the contest by Yoplait and Fiber One through my affiliation with MyBlogSpark. As always, the content and my opinions are my own and are not influenced by the companies involved in the promotion.